Decoration Full-page miniatures in colours (ff. 27, 27v, 28, 28v). Smaller miniatures on every page illustrating the bestiary (ff. 36-67v). Large initials in blue with red penwork decoration. Small initials in brown or red. Rubrics in red. Paraphs in blue or red, some with penwork decoration. Decorated nota marks, some with a face or animal head (ff. 108v, 118v). Guide letters for rubricator. Binding Post-1600. Green leather with gold tooling; gilt edges; marbled endpapers. Provenance The image of an anonymous Dominican friar implies Dominican patronage (f. 27). Contents note in 16th-century Gothic cursive script (f. 1v). Richard Edwards: 17th-century inscription 'Rich Edwards' (f. 1). F. 192 is a parchment leaf with a 18th-century ? Inscription. Richard of Thetford, Ars dilatandi sermones (ff. 186-190). The text on the vices by Gulielmus Peraldus was written c. 1236. This manuscript includes the unique illustration of Peraldus's text. Select bibliography A Catalogue of the Harleian Manuscripts in the British Museum, 4 vols (London: Eyre and Strahan, 1808-12), III (1808), no. 3244. A Selection of Latin Stories from manuscripts of the thirteenth and fourteenth centuries; a contribution to the history of fiction during the Middle Ages, ed. by Thomas Wright (London: Percy Society, 1842), VIII, p. 112 (for transcription of some texts). Walter de Gray Birch and Henry Jenner, Early Drawings and Illuminations: An Introduction to the Study of Illustrated Manuscripts (London: Bagster and Sons, 1879), p. 6. H. L. D. Ward and J. A. Herbert, Catalogue of Romances in the Department of Manuscripts in the British Museum, 3 vols (London: British Museum, 1883-1910), III, J. A. Herbert, pp. 457-63. M. R. James, The Bestiary: Being a Reproduction in full of the Manuscript Ii.4.26 in the University Library, Cambridge (Oxford: Roxburghe Club, 1928), p. 17, no. 22. C. H. Talbot, ‘A List of Cistercian Manuscripts in Great Britain’, Traditio: Studies in Ancient and Medieval History, Thought and Religion, 8 (1952), 402-18 (p. 405). Michael Evans, 'An Illustrated Fragment of Peraldus's Summa of Vice: Harleian MS 3244' Journal of the Warburg and Courtauld Institutes, 45 (1982), 32-55. Nigel Morgan, Early Gothic Manuscripts, 2 vols, A Survey of Manuscripts Illuminated in the British Isles, 4 (London Harvey Miller, 1982-1988), I: 1190-1250, no. 80, figs 26-27. The Age of Chivalry: Art in Plantagent England 1200-1400, ed. by Jonathan Alexander and Paul Binski (London: Royal Academy of Arts, 1987), no. 150 [exhibition catalogue]. Two East Anglian Pictur Books : A Facsimile of the Helmingham Herbal and Bestiary and Bodleian Ms. Ashmole 1504, ed. by Nicholas Barker (London: The Roxburghe Club, 1988), p. 5. Kathleen Scott, ‘Caveat Lector: Ownership and Standardization in the Illustration of Fifteenth-Century English Manuscripts’, in English Manuscript Studies, 1, ed. by Peter Beal and Jeremy Griffiths (London: British Library, 1989), 19-63 (p. 60 n. 57). 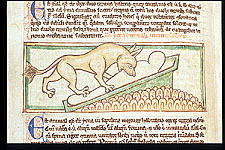 Anne Payne, Medieval Beasts (London: British Library, 1990), p. 15. Dora Faraci, Il bestiario medio inglese (Ms Arundel 292 della British Library) (Rome: Japadre, 1990), p. 258, pl. 5. 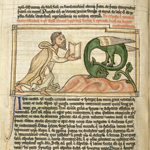 Debra Hassig, Medieval Bestiaries: Text, Image, Ideology (Cambridge: Cambridge University Press, 1995), pp. 3, 9, 11-12, 55-56, 88-91, 149, figs 89, 140. Kathleen L. Scott, Later Gothic Manuscripts 1390-1490, A Survey of Manuscripts Illuminated in the British Isles, 6, 2 vols (London: Harvey Miller, 1996), II, 195, 353. Ron Baxter, Bestiaries and Their Users in the Middle Ages (Stroud, Gloucestershire: Sutton Publishing, 1998), pp. 141, 147, 156, 189-190. The Apocalypse and the Shape of Things to Come, ed. by Frances Carey (London: British Museum, 1999), no. 8 [exhibition catalogue]. Susanne Rischpler, Biblia Sacra figuris expressa: Mnemotechnische Bilderbibeln des 15. Jahrhunderts, Wissensliteratur im Mittelalter, 36, ed. by Horst Brunner and others (Wiesbaden: Reichert, 2001), p. 45 n. 16. Alixe Bovey, Monsters and Grotesques in Medieval Manuscripts (London: British Library, 2002), p. 23, pl. 18. Paul Binski, Becket’s Crown: Art and Imagination in Gothic England 1170-1300 (New Haven: Yale University Press, 2004), pl. 147. Elizabeth Morrison, Beasts: Factual & Fantastic (Los Angeles: J. Paul Getty Museum, 2007), p. 92. 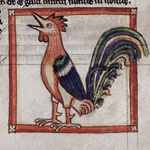 The Medieval Bestiary: Animals in the Middle Ages, ed. 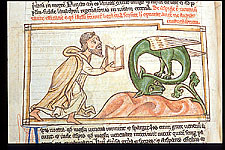 by David Badke, [http://bestiary.ca/manuscripts/manulocshelf.htm] [accessed 14 August 2009]. Mary J. Carruthers, 'Ars oblivionalis, ars inveniendi: The Cherub Figure and the Arts of Memory', Gesta (2009), 1-19, pp. 10, 13, 14, 19 ns 59-63. Aden Kumler, Translating Truth: Ambitious Images and Religious Knowledge in Late Medieval France and England(New Haven: Yale University Press, 2011), pp. 81-82, figs 15, 16.